Update! Oh boy, I just realized that I was one of the winners for the June Inspiration Challenge!! I am soooo happy! I thought this was one of the most fun techniques I've tried. 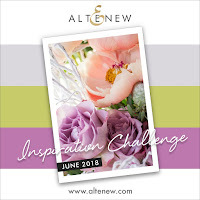 I'm submitting this to the Altenew June Inspiration Challenge and the colors this month are a wine purple, green, and gray. I began by taking a piece of watercolor paper and stamped the flowers in some distress ink and sprayed them with water after inked and stamping them down while they were dripping wet. I did the same with the foliage from the stamp set. Once everything was dry, I splattered some of the purple ink. After everything was dry I used some yellow distress ink and painted the centers of the flowers with a hint of yellow- you can barely see it, but it was just enough. 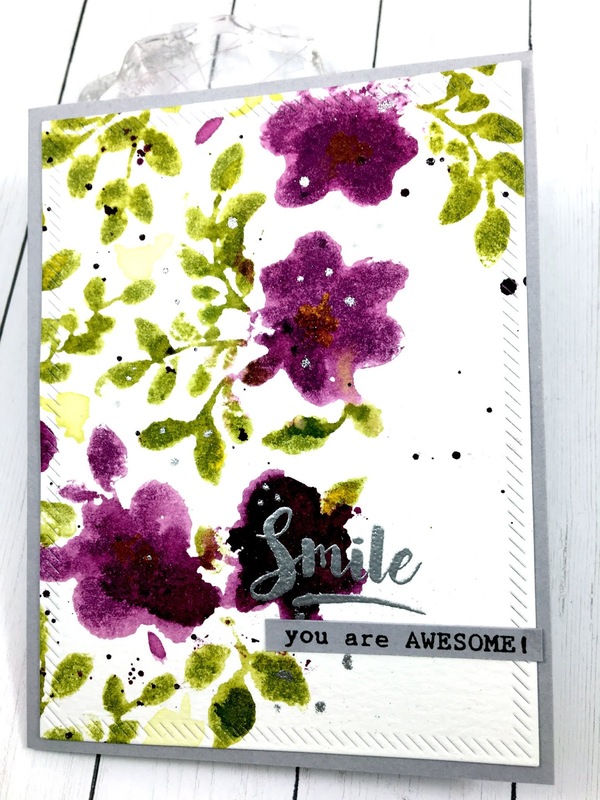 I stamped the 'smile' sentiment in versamark and then embossed it with silver. I used a versamark marker and put some random dots around the card panel and embossed those in silver also. I then stamped the 'you are awesome' in black ink onto gray and trimmed it out. I die cut the main panel with the slanted rectangle die and mounted everything to a gray card base. Thanks very much for reading and the materials used are listed below. Simply Splendid!! Congratulations on the win at Altenew! Oh thank you, thank you!! I just saw your comment and I have to tell you that I really admire your work!